Known as the Theravada School, or the School of the Elders (Skt. = Sthaviravada). Also pejoratively referred to as the Hinayana (lit. = Lesser Vehicle) by Mahayana adherents, who claim that Hinayana emphasizes personal liberation/salvation in contrast to the collective liberation of the Mahayana (lit. = Greater Vehicle). The Theravada (Jp. = Joza Bukkyo, Jōza Bukkyō) or Hinayana (Jp. = Kojyo Bukkyo or Kojyō Bukkyō) school is based on the teachings of its founder, the Historical Buddha. Known also as Gautama Buddha or Prince Siddhartha, the Historical Buddha lived in India from around 560 to 480 BC. For comparative purposes, his contemporaries were Confucius and Lao-tzu (the founder, the “old boy” of Chinese Taoism) -- slightly later in the West comes Plato (427? - 347 BC). In India, in the four centuries following Gautama’s death, his dialogues and teachings were preserved only in the memory of followers. No written records or artistic representations (except for the footprints of the Buddha) survive into the present age. Like the Hindu Brahmins, the early Buddhists believed that religious knowledge was too sacred to be written down, too sacred to be etched in stone or wood. The Theravadins clearly differentiate between monks and laity. Only those who practice the meditative monastic life (i.e., the monks) can attain spiritual perfection. Enlightenment is not thought possible for those living the secular life. Theravadins revere the Historical Buddha, but they do not pay homage to the numerous Buddha and Bodhisattva worshiped by Mahayana followers. The highest goal of a Theravadin is to become an Arhat (Skt), or perfected saint. (Japanese Rakan or Arakan). The early Buddhists split into a number of factions following Gautama’s death, each faction holding firm to its own interpretations. 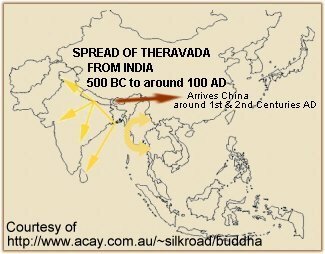 Roughly 500 years later, two main schools emerged -- Theravada (pejoratively called the “Lesser Vehicle”) and Mahayana (“Greater Vehicle”). 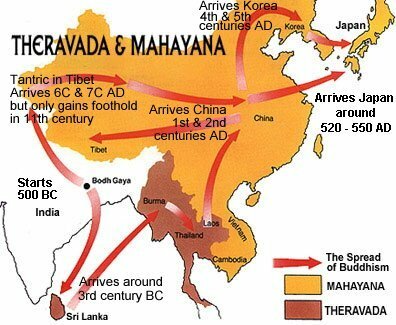 Theravada sought to preserve the original and orthodox teachings of Gautama Buddha, while the Mahayana tradition was more flexible and innovative. At the time, the distinction between Lesser and Greater Vehicles was politicized into arguments over “benefitting self” and “benefitting others.” Mahayana adherents insisted that only by “benefitting others” could one hope to benefit oneself. To Mahayana followers, the Theravada philosophy is false, for Theravada stresses “self benefit” -- practicing by oneself strictly for one’s own emancipation. See Additional Readings for more on this early schism. The earliest documents of the Historical Buddha’s teachings are found in Pali literature, and are attributed to the Theravadins, the Elders, the first community of followers in India in the early centuries after Gautama’s death. This community of early followers was known, in Sanskrit, as the sangha or samgha. See Additional Readings to learn about their early efforts to recall and codify the teachings of the Historical Buddha. Lord Buddha’s fundamental teachings are to abstain from evil thinking and action, to purify the mind by practicing ethical conduct and meditation, and through these activities, to develop insight / wisdom (prajna in Sanskrit). The foundations of Buddhist philosophy proclaim that all worldly phenomena is unsatisfactory, transient and impermanent; there is nothing one can call one’s own; the world is an illusion; and our suffering is caused by our clinging to the world of illusion (the world of desire). The goal of the Theravada Buddhist is to attain these insights, internalize them, feel them, live them, and thereafter become an enlightened Arhat. Theravada Buddhism is still practiced widely in Southeast Asia, where its principles have been accepted with few differences in interpretation, but Theravada is not practiced widely in Japan. The Theravada school advocates the meditative monastic life as the path to salvation and liberation, a path reserved for those few (the monks) who can give up all to follow its austere practices. In contrast, Mahayana Buddhism (the “Greater Vehicle”) focuses on collective liberation -- not just for monks, but for laity too. The Mahayana school allows the masses to enjoy the pleasures of worldly life while still bringing them the hope of salvation. Found mainly in Sri Lanka, Burma, Cambodia, Laos, and Thailand. Often known as the Southern Traditions of Buddhism. Found mainly in China, Korea, Vietnam, and Japan. Often known as the Northern Traditions of Buddhism. Practiced mainly in Tibet, Nepal, and Mongolia, but in Japan has a strong hold with the Shingon 真言, Tendai 天台, and Shugendō 修験道 sects. In Japan, Esoteric Buddhism is known as Mikkyō (Mikkyo) 密教). Along with Mahayana Buddhism, the Vajrayana traditions are often referred to as the Northern Traditions of Buddhism.